Somewhat unexpectedly, the summer holidays have flown by. We have had a fun-packed seven weeks and for the main, amazing weather to boot. The amount of time we’ve spent outdoors this summer has reminded me how lucky we are to live in this beautiful part of the world with sandy beaches, sprawling forests, historic castles, natural playparks and abundant wildlife all on our doorstep. One weekend spent on the east coast, we enjoyed a falconry display in the beautiful gardens of Dunrobin Castle; a peregrine falcon flying literally millimetres above our heads eliciting gasps of amazement from our girls (along with the rest of the rapt audience). We also watched powerful salmon leap upstream at the Falls of Shin before having a particularly enjoyable family walks in the nearby woodland. There was so much to see and do on the short circular route from picking wild raspberries and blacberries to spotting animal wood carvings as well as forest ‘games’ with hoops to throw over wooden posts, slides made from agricultural tubing and a timber agility course. Then there has been the usual vibrant cycle of town galas and village fetes, traditional Highland Games all across the region as well as big agricultural shows and music festivals. It’ll be a shock to the system getting back into the school routine again, but Daisy is ready for it and Mollie and I will return to our weekly classes and resume the local toddler group with our friends. We are hoping that the processing arm of the business here on the farm will also return to some sort of normality with the end of the summer holidays. The volume of ice cream sales – along with the milk and yoghurt – has been phenomenal this year and clearly it is a good complaint to be as busy as we’ve been over the past four months, but struggling to keep up with demand has been stressful at times. And none more so than when the ice cream machine packed up right in the middle of show week. The first week of August is when we set up shop at two local summer events – the Black Isle Show and the Highland Field Sports Fair at Moy – for four days. On the second day of the Black Isle Show, the sun was shining and the queue was 50-deep when Nick got a call from the farm to report the break down. This key piece of equipment has been working around the clock all summer and luckily, with a little tinkering, it kept going for the rest of our busy week of shows, albeit at half-speed. It wasn’t long before it broke down entirely though and unfortunately for us, the Italian company – where the necessary spare parts come from – also shuts down for the entire month of August (trades fortnight’ Italian-style!). Fortuitously, Nick had bought a second-hand ice cream maker a few months ago from a fellow food producer exiting the gelato business. He intended to add it to the production kitchen but the electricity fuse board wasn’t sufficient to accommodate it at the time. The shows may have finished but trade orders still had to be fulfilled and the honesty shop stocked, so our electrician was called and the new-to-us gelato maker put to work. Things are now back on track and the original ice cream machine will be resurrected sometime next month, we hope. Elsewhere on the farm, Nick has added a further 16 Ayrshire heifers to the Rootfield herd in a bid to increase the proportion of Ayrshires in it. Taking advantage of a herd dispersal, one of the oldest registered pedigreed Ayrshire herds in the country, nine of the cows Nick bought were already in-calf and the remaining seven are of bulling age. As written about previously, Nick’s principal client – Rory Stone of Highland Fine Cheeses in Tain, who buys 90% of the farm’s milk – has a preference for Ayrshire milk due to its excellent constituents for cheese-making. Clearly, this was Nick’s primary reason for increasing the number of Ayrshires in the herd but at the same time, it addressed another concern, namely that he is currently short of cows in the Rootfield herd. This is due to the high incidence of male calves born in the past two years and was also what attracted him to the in-calf heifers from the recent dispersal. From me and the girls’ somewhat simpler perspective, it’s lovely to see the cows, new and old, out in the fields behind our garden at the moment, all different shapes, sizes and colours – the dinky, nosey Jerseys; the tall, angular black and white Holstein-Friesians and the traditional, dappled chestnut-brown and white Ayrshires. That said, two of the new Ayrshires are black with speckled white coats, which we’ve never seen before. We love to watch them frolic about as they get to know their new bovine buddies and see which cows are bold enough to visit us at the garden fence; some get close but the cheeky Jerseys usually nudge their way to the front. At least the grass is starting to look lush and green again for them thanks to the recent rainfall. Happily, Nick managed to get almost two thirds of his silage pit full with his second cut silage at the end of July and because the grass is growing again, is planning a third cut. Other farm work just now includes reviewing the winter ration to try and control escalating feed costs and the sheds are being cleared out and cleaned down in preparation for harvest later this month. 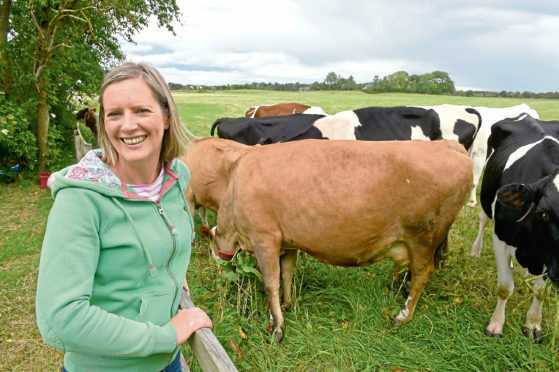 * Rootfield Farm is on the Black Isle, 10 miles north of Inverness, where Jo lives with husband Nick, a fourth-generation dairy farmer, their daughters Daisy and Mollie, and 170 cows.